Wet shaving is the fastest growing service in the men's grooming industry. If you have a barbershop or salon and want to offer the Edwin Jagger Shave, contact us for more details on how we can help you with training, tools and products. For customers who have enjoyed using our razors, brushes and shaving creams for many years, we are delighted to introduce our wonderful new range of natural ingredient shaving creams, shaving soaps and aftershave lotions. Demand for finest quality products with genuine natural ingredients motivated us to search for something really special. Our unrivalled experience of manufacturing specialist wet-shaving products gave us true insight into what is required of the finest shaving creams, soaps and lotions. The result is a carefully formulated range which adds a new dimension to the international Edwin Jagger brand. Desire fuels the demand, inspiration the creativity and the Edwin Jagger shaving collection is the luxurious outcome. Edwin Jagger, established in 1988, designs and manufactures a range of classic and contemporary high quality wet shaving accessories. Expert design, carefully selected materials and cutting edge manufacturing processes, combined with hand finishing, result in absolute product perfection. Our extensive range of shaving razors incorporating the latest razor blade systems, pure badger hair shaving brushes, straight razors, shaving sets, shaving creams and soaps meets the grooming needs of gentlemen today. Internationally renowned for exquisite workmanship Edwin Jagger manufactures for many exclusive suppliers and is able to offer product branding, special designs and individual packaging. Dedication and commitment to quality is synonymous with Edwin Jagger products, which are used by discerning wet shavers the world over. For more than two centuries badger hair has been used to make the best shaving brushes; it is quality graded according to the appearance and softness of the hairs; the ascending classifications Edwin Jagger use are best, super and silver tip. The cost of any brush reflects the quality and quantity of hair used for the brush. Badger hair naturally absorbs water. Consequently, when the shaving brush is combined with hot water and quality Edwin Jagger shaving cream or soap, the lathering process introduces air and creates a warm, rich creamy lather that cleanses the skin, lifts the beard hairs and lubricates the path of the razor. Best badger is a good quality of pure badger hair which is normally regarded as the benchmark standard of shaving brush manufacturers. It is generally darkish in colour although the colours of individual hairs vary from grey and brown to black. This quality creates a lather far superior to that resulting from the use of a bristle brush. Super badger is longer and softer than best badger and because it is also finer, more hair is required to fill a brush. This high quality badger hair is hand graded and tied; visually the hair is darker at the base and very light in colour at the tips. It presents in a natural fan shape created by hand. Unlike some manufacturers we do not trim the hair to create the overall badger bundle shape so that the soft hair tips remain intact. Silver tip badger is highest quality of all. This finely graded and sorted badger hair is the softest, rarest and most expensive badger hair with natural untrimmed silver tips to each hair. At Edwin Jagger our finest quality silver tip shaving brushes are hand filled with the ultra soft and flexible hair to provide years of luxurious shaving. 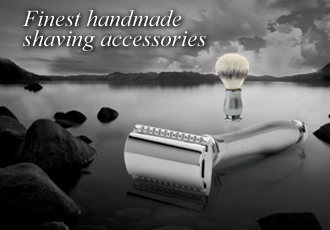 Edwin Jagger is regarded as the foremost manufacturer of exquisite design cut throat razors and shaving sets. Choosing only the finest materials and combining cutting edge manufacturing processes with age old skills of the craftsman we produce an unrivalled collection of traditional and contemporary styled razors, shaving brushes and shaving sets. Using the Gillette® Fusion® ProGlide™, Gillette® Mach3® and traditional safety or double edge blade systems we create products that satisfy the desires of all discerning wet shavers. At Edwin Jagger we understand and share the environmental and health concerns of our customers and place great emphasis on selecting the very best natural ingredients for our range of traditional hard shaving soap, premium shaving creams and aftershave lotions. It is of paramount importance to us that we offer our customers shaving products that are both safe and effective for the skin and at the same time environmentally friendly. Our products comprise 99% natural components, many derived from organically cultivated plants, replacing synthetic substances and mineral oils. All Edwin Jagger products are paraben and paraffin free. Wherever possible the natural ingredients are obtained using energy efficient means. For example our supreme quality Indonesian Sandalwood oil, like many essential oils, is extracted using a water steam distillation process while the natural gel used for the Aloe Vera products is squeezed from the plant using a press. The luxurious lathering properties of our creams, soaps and lotions are enhanced by subtle natural extracts of Aloe Vera, Sandalwood and Limes and Pomegranate for a wonderfully smooth shaving experience. Subtly fragranced rich, concentrated Edwin Jagger shaving cream is specially formulated using a unique combination of organic ingredients, enhanced by plant extracts, to create a luxurious lather for a smooth and comfortable shave. When used with hot water and, ideally but not necessarily, a good quality shaving brush, even a small amount will produce a thick creamy lather. The combination of brush, hot water and natural ingredients will soften and lift the beard in preparation for the razor blade. Edwin Jagger Premium shaving creams are available in tubs or tubes. Traditional hard shaving soap are individually packaged refills. Aftershave Lotion presents in a smart glass, pump action dispenser. All our products are presented in distinctive Edwin Jagger packaging. The card used for the elegant Edwin Jagger presentation boxes has been chosen for its combination of 80% recycled material and the remaining 20% from sustainable sources. The moisturising and subtly fragranced Edwin Jagger aftershave lotions complement our shaving creams and shaving soaps. Using natural ingredients these non-greasy facial balms soothe, nourish and revitalise shaven skin leaving the face feeling smooth and comfortable. Use Edwin Jagger lotion after shaving to nourish, moisturise and revitalise the skin. Essential protection against the elements.